This guy is the next big thing, he has a fantastic voice. 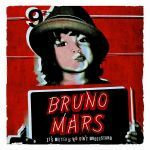 I sure can't wait until Bruno's album is released, all 4 tracks from this EP are great. Better than the album, mostly because it's shorter, but also because it mostly avoids his duller songs. Gutes erstes Aufzeigen des sympathischen Briten.